Experience unmatched comfort and exceptional visual stability even under harsh circumstances with Acuvue Oasys for Astigmatism 12 Pack Weekly disposable contact lenses. Presented by Johnson & Johnson, this much-popular brand is a great choicefor people who lead a busy and active lifestyle. Recommended for those who sufferfrom astigmatism, Acuvue Oasys for Astigmatism 12 Pack Weekly disposable contact lenses boast the revolutionary Blink Stabilized design, which realigns naturally with every blink of your eye. This is highly effective in keeping your vision crystal clear and stable. The patented HYDRACLEAR?PLUS?Technology ensures your lens is ultra-smooth and moist, with a higher passage of oxygen than traditional contact lenses. Acuvue Oasys for Astigmatism also features the highest UV-A and UV-B protection so far available in contact lenses. So your eyes will be safe from theharmful UV radiation of the sun. 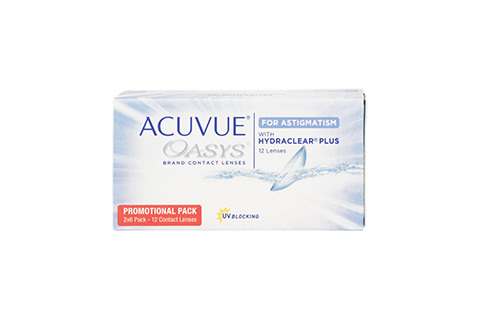 If you are experiencing wearing discomfort, fluctuating, or blurred vision with your present lenses, then you must certainly try Acuvue Oasys for Astigmatism 12Pack Weekly disposable. You can wear thesecontact lenses for consecutively up to 6 nights ordaily for two weeks. To get the best results, follow your doctor's prescribed wearing schedule or just get in touch with our professional yet friendly online opticians at Mister Spex.